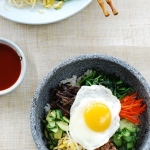 One of the nice things about bibimbap is its versatility. 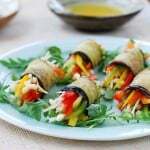 It can be made in many different ways with any combination of vegetables and proteins. 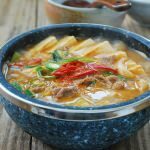 As such, you can use leftover side dishes from previous meals or quickly cut up and blanch or saute whatever ingredients you have in the fridge. You will always end up with a whole satisfying meal! 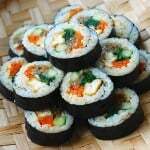 I previously posted two bibimbap recipes on the blog – traditional bibimbap and tuna bibimbap. 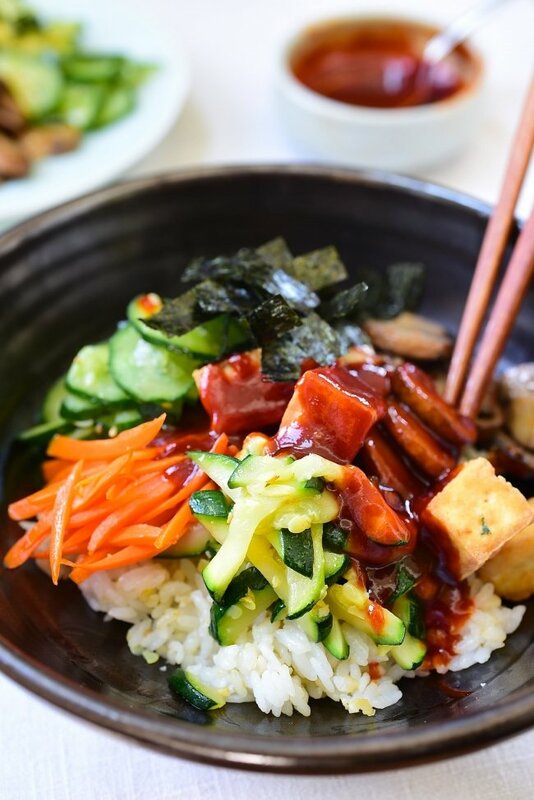 Here, I created a simple vegan bibimbap recipe with tofu as the protein choice. 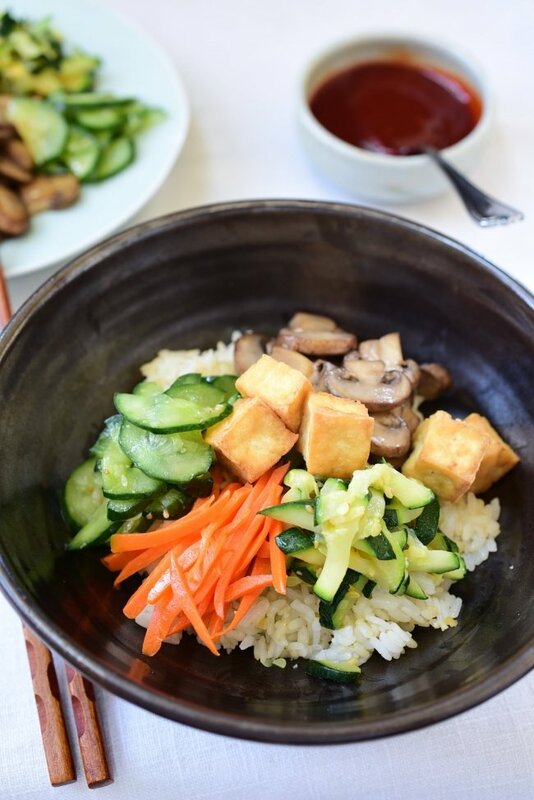 The vegetables I used in this bibimbap recipe can easily be found in your local grocery stores, so you can make bibimbap without a trip to a Korean market! You all have gochujang, right? 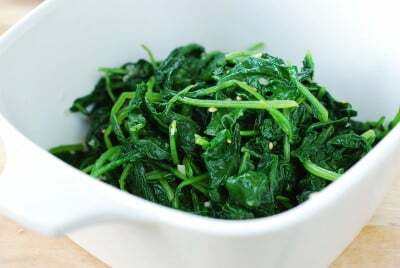 For Korean bibimbap, the vegetable choices are endless: zucchini, baby kale, carrots, mushrooms, cucumber, spinach, watercress, turnip greens, Swiss chard, broccoli slaw, orange or red color bell peppers, red cabbages, dried seaweed sheet (gim), etc. 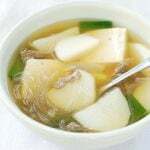 You only need 3 or 4 of these vegetables to make a delicious Korean rice bowl. To make the bibimbap sauce, I used a little bit of apple cider to thin it while adding a fruity sweetness. Korean plum extract will be great as well if you have it, or you can simply use sugar and thin it with water. See my other bibimbap sauce. Who says bibimbap has to be served in a huge bowl? I recently attended a Korean event where bibimbap was served in small clear plastic cups. What a cute idea for a large group (also for your children)! 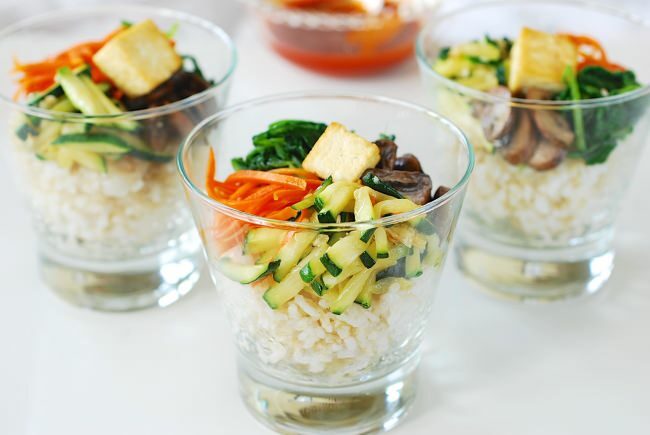 Your picky eater might even eat a cup of bibimbap full of vegetables. The tableware (except the glassware) shown in the final photos of this post are sponsored by Huue Craft, an online store dedicated to the finest Korean pottery tableware. They ship worldwide to over 25 countries. Visit Huue Craft online store for the beautiful tableware created by five of the renowned potters in Korea! Cook the rice in a rice cooker or following package directions, using a little less water than called for. Rice for bibimbap should be slightly drier than usual for best results. Cut the zucchini into match sticks. Sprinkle with 1/2 teaspoon of salt, and let sit for 10 to 15 minutes. Squeeze out the liquid. Heat a pan with a little bit of oil. 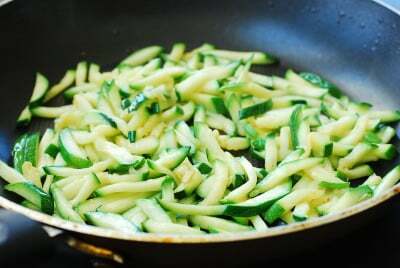 Add the zucchini and 1/2 teaspoon minced garlic. Sauté for 2 - 3 minutes over medium high heat. Stir in 1 teaspoon sesame oil. Blanch the baby kale briefly in salted boiling water. Drain quickly, and shock in cold water. Drain again, and squeeze out the water. Toss with 1/2 teaspoon garlic, 1/2 teaspoon sesame oil, and salt and pepper to taste. Cut the carrots into match sticks. Heat the pan again with a little bit of oil. 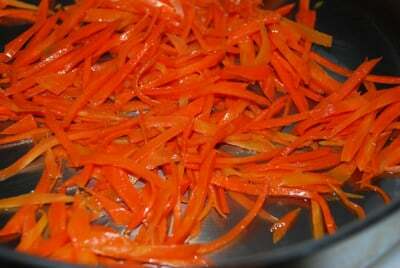 Sauté the carrots for 1 - 2 minutes over medium high heat until slightly softened. Sprinkle with salt and pepper to taste. 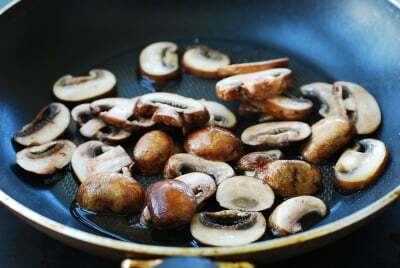 Remove the stems off the mushrooms and cut into 1/4-inch thin slices. Sauté in the lightly oiled pan for 2 - 3 minutes over medium high heat. 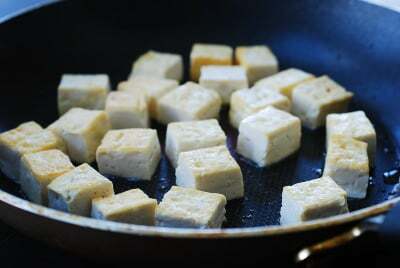 Cut the tofu into about 3/4-inch cubes, and lightly sprinkle with salt. Heat the pan with a tablespoon of oil, and pan-fry the tofu until all sides are lightly golden. Place a serving of rice in a bowl. 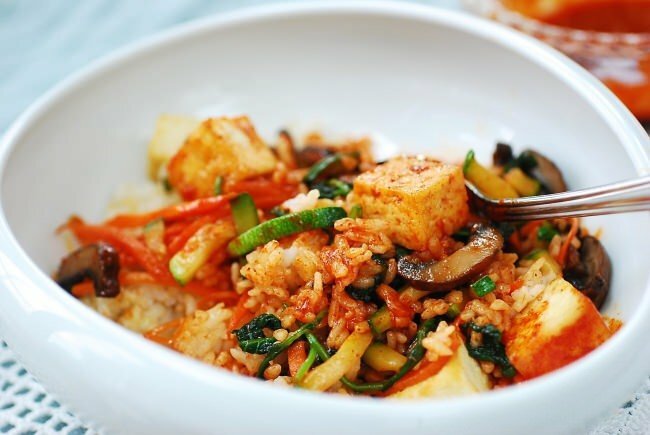 Nicely arrange a small amount of each prepared vegetable over the rice and top with a few tofu pieces. Drizzle a little sesame oil over. 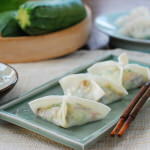 Serve with the red pepper paste sauce. 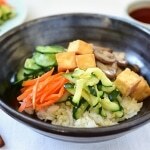 See the other bibimbap recipe if you want to add cucumber, or other vegetables. This looks really yummy. I need to try this recipe out. It’s delicious! Hope you try it soon! Hi (again) Hyosun! I made this as well last night, but added eggplant because i had it and needed to use it up. It was yummy in my tummy! Soooo good, I looooove your blog. keep up the awesome blog! Awesome! You’re cooking a lot of Korean food these days. Keep up the good work! It’s funny how you also used eggplant. I started this recipe using eggplants, but deleted to simplify the recipe a little. 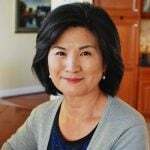 Thank you for using my recipes and for the nice words! I like how you explain why each step is important. Like how we can drain the potato of its water content and get the starch after ratehr tahn having a watery batter because i previously copied another recipe but they skipped the part about draining the water to get the starch. Thanks. Sounds like you’re talking about gamjajeon (potato pancakes). Thank you! Sure. Bibimbap can be made with anything. 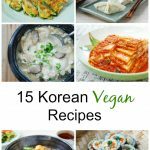 Some green veggies or even kimchi will be good.